When it comes to stylish cafes, Korea has it all. And if you feel like something is missing… it’s probably Hello Kitty. How could you not feel complete with this Japanese feline keeping you company while sippin’ on a cup of joe with her face in it? There are three Hello Kitty Café locations in Seoul and if you are any type of fan, you have to see one. I’ve only been to two of the Seoul locations with similar themes and differing designs. Each café puts you smack dab in the fantasy bedroom of any five year old girl, from an overwhelming amount of pink, bows and plushies to themed pictures, ceramics, furniture, wall openings and everything nice. Of course the coffee is delicious and comes served in adorable Hello Kitty mugs, and if you want HK coffee art be sure to ask for ‘no whip’. The snacks are a little pricey for the portions, but with that cute kitty face staring at you, who could mind? The most appealing to any first time visitor is the Hello Kitty Cake, which is a soft gelatin cream cake molded into HK’s face. It’s super cute, but definitely more cream than cake. If I HAD to choose from the three flavors (vanilla, strawberry & chocolate), the strawberry looks the cutest but the chocolate tastes the best. To be honest though, if you want to try anything I recommend the tiramisu. It may not be gourmet but it melts in your mouth and makes cutting into Kitty’s face all the more satisfying. The waffle is pretty good too. I’ve been to this cafe more times than I care to admit, but most of the time it’s to take a visiting friend or relative. Aside from its obvious uniqueness, it’s just a cheery place to sit in so I don’t mind going on a random day just for fun. I even took my dog there once (lol). To keep things fresh they always introduce promotional and seasonal drinks and snacks, so you never have to worry about ordering the same old thing every time. If you plan to drop by any of these enchanting pink wonderlands, make sure you have time to spare. As lovely as these cafés are, their small two floor layout is a bit on the snug side. As you can imagine, they attract a lot of attention, especially in 홍대 (Hongdae). It won’t be unlikely to find yourself on the prowl for 30 minutes (alongside 10 other wide-eyed prowlers) just to get your paws on a table. So, be prepared! When all is said and done I know you’ll adore the sweet, pink, sugary induced coma that is Hello Kitty Café. But, if you find it hard to part from this caffeinated fantasy you can always pick up a coffee mug or plush from the gift section to take with you on the road. 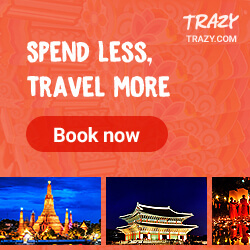 Tags: Best Cafés in Seoul, Cafés, cafes in Korea, Hello Kitty, Hello Kitty Cafe, Hongdae Cafes, Korean culture, Photography, Seoul, Shinchon Cafes, South Korea, tourist attractions in Korea, travel, Traveling in Korea. Bookmark the permalink. Previous post ← Is there a Dr. in the Café? Good article. 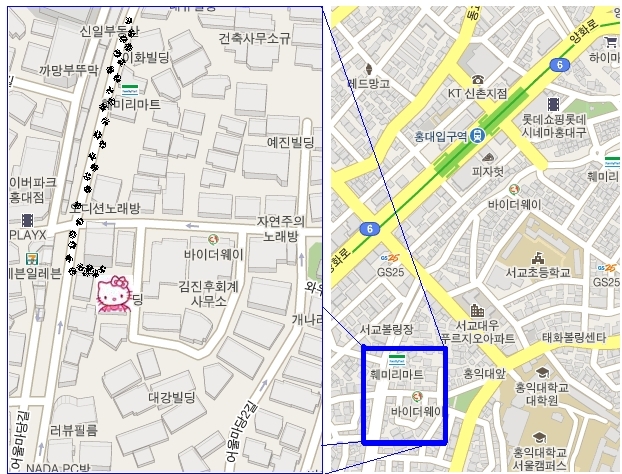 Any chance you can put up maps or directions to the other Hello Kitty Cafes in Korea?